NASA's MESSENGER spacecraft caught this view of the planet Mercury during an Oct. 6, 2008 flyby. Scientistsare tackling new oddities at the planet Mercury via images beamed home by aNASA spacecraft that zoomed past the small, rocky world earlier this month. NASA’sMESSENGER spacecraft returned 1,287 new views of Mercury during an Oct. 6flyby, the second this year, which revealed nearly a third of the planet thathad never seen before. The result: visions of Mercury’s westernhemisphere showing an area that is 30 percent smoother than the planet’seastern half. “Weneed to think hard about why that’s actually the case,” said MariaZuber, a MESSENGER co-investigator at MIT in a Wednesday briefing. During thismonth’s encounter, MESSENGER’s cameras caught an odd feature onMercury, a so-called “wrinkle ridge” some 1,968 feet (600 meters)high, about twice the height of similar features seen on Mars, suggesting theplanet has contracted in on itself considerably as it cooled, Zuber added. The newphotos show some empty craters on Mercury lying next to others nearby that arefilled in by vast, solidified lava flows. One such crater was filled with somuch solidified lava that, on Earth it would bury the Baltimore-Washington,D.C., metropolitan area in a layer 12 times the height of the 555-foot(169-meter) Washington Monument. Images fromMESSENGER’s first swing past Mercury earlier this year yielded evidencethat ancient volcanic activity, not space rock impacts, shaped theplanet’s smooth plains. Altogether, MESSENGER's two flybys and NASA's earlier Mariner 10 mission have mapped about 95 percent of Mercury's surface, reserachers said. Otherinstruments aboard MESSENGER found strong interactions between Mercury’smagnetic field and the sun’s solar wind, which led to supercharged energyexchanges equivalent to the output of about 100 medium-sized power plants onEarth, researchers said. Thespacecraft also spotted magnesium in Mercury’s wispy, tenuous atmospherefor the first time. Infrared views of the planet’s surface revealed moreviews of material that currently defies identification, but shows up dark bluein enhanced images. “Wereally want to get into orbit so we can get some geochemical measurements ofthis material so I can stop saying blue material,” said Mark Robinson, aMESSENGER co-investigator at Arizona State University, adding that the oddstuff could be some sort of opaque mineral. 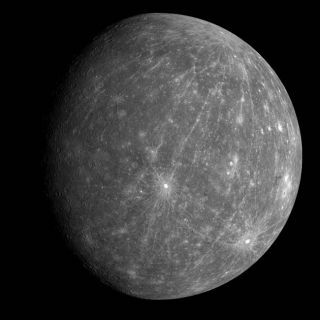 MESSENGER,short for MErcury Surface, Space ENvironment, GEochemistry, and Ranging, is thefirst spacecraft to take a close look at Mercury since NASA’s Mariner 10probe zipped by the planet three times in 1974 and 1975. But unlikeMariner 10, the $446 million MESSENGER mission is destined to circle Mercury for at least a year once itenters orbit on March 18, 2011. The spacecraft launched in August 2004 and flewby Earth once and Venus twice before zipping past Mercury for the first time onJan. 14 to use each planet’s gravitational pull to tweak its flight path forthe 2011 rendezvous. The Oct.6 Mercury flyby was MESSENGER’s second of three planned swings pastthe planet. The third is set for September 2009.